Husain A. Jamid received the B.S. and M.S. degrees from Arizona State University, Tempe, AZ, in 1981 and 1983, respectively, and the Ph.D. degree from King Fahd University of Petroleum and Minerals (KFUPM), Dhahran, Saudi Arabia, in 1986, all in electrical engineering. 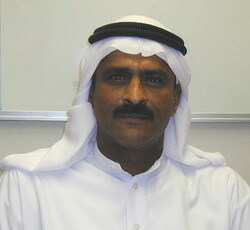 He is currently a Professor with the Electrical Engineering Department, KFUPM. He has done research work in metal-clad as well as nonlinear optical waveguides. His current research interest is in optical device simulation and development of related numerical methods. Dr. Jamid has received the KFUPM Excellence in Teaching Award three times. He has been the Electrical Engineering Subject Editor for the Arabian Journal for Science and Engineering between June 2005 and October 2007. Integrated Optics, Method of Lines, Optical Polarizer, Metal-Clad Waveguides, 2D and 3D MoL, Padé Approximants. Sunday: 9:30-10:00 AM & 12:00 PM-1:00 PM. Tuesday: 9:30-10:00 AM & 12:00 PM-1:00 PM.